Question: Can you advise what is covered under the naming service and how many names will be given for selection? 1. Thank you for your interest in our service. I will assist you on this portion, since I specialize in this area. 2. Usually, I will work out the best names available from various top name stroke groups (usually 80%-100% name stroke groups). 2.1 Depending on number of strokes of each group, some may have more 5-10, some may have less (1-5). But all in all there should be quite a lot of names available to pick from. 3. The names I normally match will be characters that are meaningful, so it will sound nice and have some meaning (if possible). However, should you not find a name you like from the groups, a character reference list is also provided, so that you can also match out other names you may like from the list to check if it is suitable. 4. 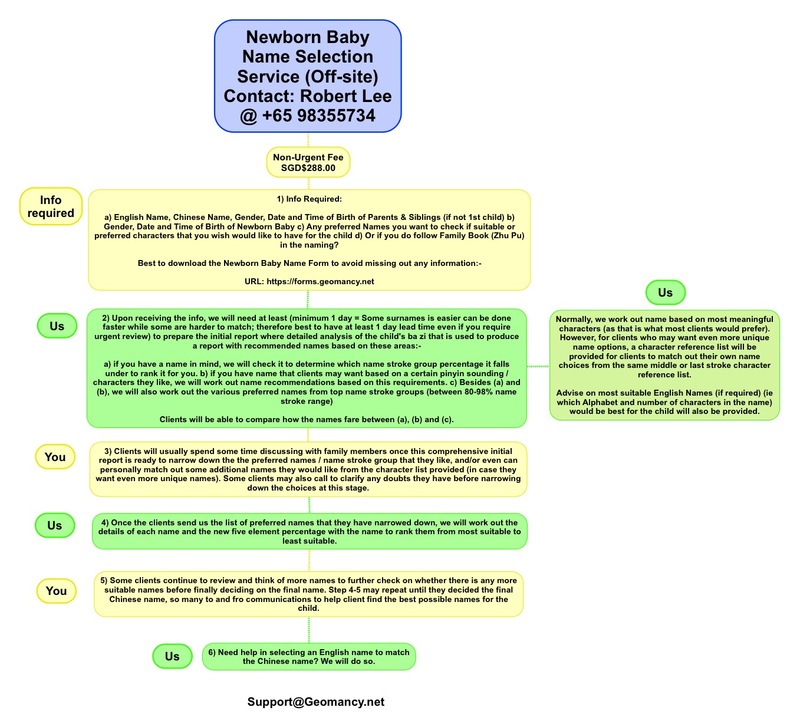 So that you will have as much choice to find the most suitable name available, so as to help you find the best and most suitable name for your child. 5. In addition, if you have special requirements such as if you use family ancestral naming, I will can also find names restricting the say the middle character to that character. 6. Or if this is a 2nd/3rd child and you want to keep a certain middle or last character as a common sibling character. I will also work out names accordingly. 7. Or even if you have already some preferred names in mind, I can also check on those name and see how it fairs against the best available name stroke group. 8. So not to worry, it is quite a comprehensive process, often than not, there will be a lot of to and fro communication between the clients and me. As once I prepared the initial report, clients will take a while to go through and attempt to narrow down to the preferred name. Then when they have a list of preferred names, I will then summary the names in detail to give you the percentage breakdown of how the name fit to the ba zi, this way it will be easy to determine which is the most suitable name. HOTLINE: +(65) 9835-5734 WhatsApp enabled. Clients will be able to compare how the names fare between (a), (b) and (c). Normally, we work out name based on most meaningful characters (as that is what most clients would prefer). However, for clients who may want even more unique name options, a character reference list will be provided for clients to match out their own name choices from the same middle or last stroke character reference list. Advise on most suitable English Names (if required) (ie which Alphabet and number of characters in the name) would be best for the child will also be provided. 3) Clients will usually spend some time discussing with family members once this comprehensive initial report is ready to narrow down the the preferred names / name stroke group that they like, and/or even can personally match out some additional names they would like from the character list provided (in case they want even more unique names). Some clients may also call to clarify any doubts they have before narrowing down the choices at this stage. 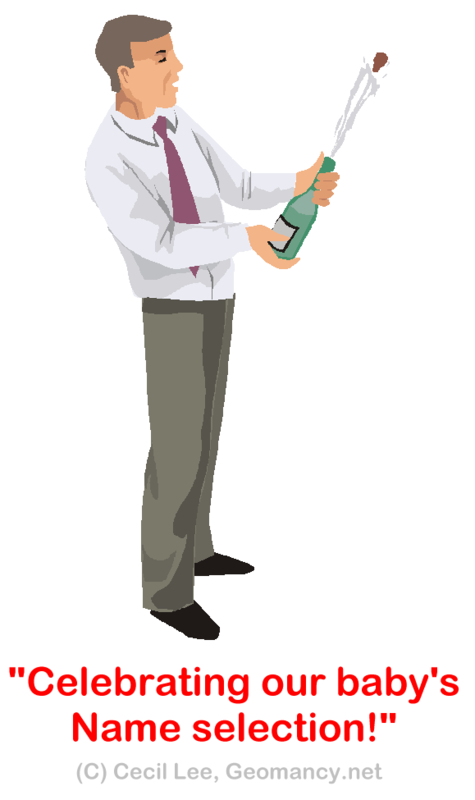 5) Some clients continue to review and think of more names to further check on whether there is any more suitable names before finally deciding on the final name. Step 4-5 may repeat until they decided the final Chinese name, so many to and fro communications to help client find the best possible names for the child. the Chinese name? We will do so. 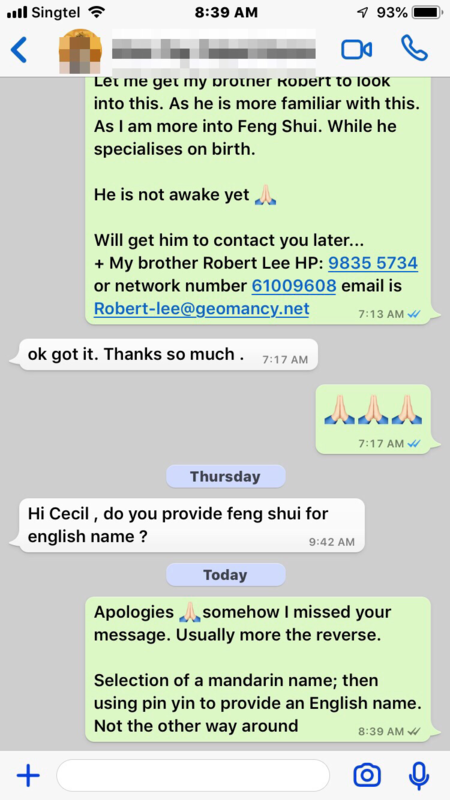 Hi Cecil , do you provide feng shui for english name ? Apologies somehow I missed your message. Usually more the reverse. It is a tradition for many Chinese to have their baby's name selected based on their ba zi.